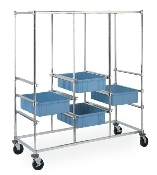 Metro Kitting Carts provide efficient handling of totes, PCB carriers, trays or other material handling containers. This triple bay unit includes 2-brake and 2-swivel casters in your choice of resilient rubber or polyurethane tread. #PT3C-5M: 26" x 60-7/8" x 68"h (660x1545x1727mm) with Resilient casters. #PT3C-5MP: 26" x 60-7/8" x 68"h (660x1545x1727mm) with Polyurethane casters. Triple-bay carriers are equipped with (6) single slides (catalog no. S3C), (3) sets and (6) double slides, (3) sets. Order additional slides and totes (TB93000 series) separately. ESD Classification: Non-Conductive (Units can be made conductive by utilizing catalog no. GCB16S grounding bracket and catalog no. ASK16S grounding cable, see Electronics Carts/Covers).